Since past some time I’ve noticed and surely you must have too that there is a crazy buzz around Python programming language in the programmer community. Many of you have been asking me about the viability and usefulness of learning this scripting language in terms of your career choice. So, I thought to quickly share some useful information on Python programming language. In addition, I also wanted to talk about the advantages that you will get should you choose to learn Python. Whether you are a seasoned programmer or just a beginner looking to learn Python programming. Here is some good research from where you can start off. Or for that matter evaluate if it’s the right choice for you. What Is Python Used For? Is It Worth Pursuing? These are just the ones that have already been using Python programming. I’m sure there are many more unchartered fields which would be discovered soon enough. What the multiple application of this programming language does that is to diversify the job opportunities. And this my folks is what gives it an edge. Python programming skill can do wonders for your career options. That’s Great, But What Are The Benefits Of Learning Python? I used to code in Java, I still do, but sometimes it’s easier & more efficient in Python. For instance, whereas it takes me around 100 lines of codes to write any function for analytics, I could do that in 30% to 35% less LOCs in Python programming. This particular feature is the root of almost all the advantages that we are going to discuss next. Another thing which I felt helped me a lot is the huge developer community. See, what happens is that whenever you get stuck with a Python program, you can put up your problem and get instant help. Also Python programming language is an open source language hence new APIs are constantly being developed and placed out there for the fellow programmers to use. So, if you are planning on going for Python programming course, here are some more advantages that you may enjoy! Simple to comprehend and effortless to learn. I can say this from my own personal experience that it took me less time to learn Python as compared to C, C++, Java and PHP. And the large community aids the learning process further. Most of the OS platforms currently in play in the industry, support Python programming language. Not only that, it can be integrated with Java and .NET components. At the same time you can invoke C++ as well as C libraries. Those of you who are planning to make a career in web development should consider browsing through Python tutorial right away. Why I say this is because, Python provides multiple robust frameworks for your website development needs. These include Django, Pylons and Flask etc. Simply the range of application of Python language is considerably large. This makes it multi-purpose. If you are well-versed in Python GUI then you can opt for any one of these – coding, testing or security for your career. Cutting edge technologies like Cloud computing and Artificial Intelligence are also highly compatible with Python. Therefore, having knowledge of Python basics as well as advance gives you superiority in the IT industry. You may also have a better chance at landing the job of your dreams. Sounds Interesting! But What Should We Learn In Python? So, now that you have decided that Python is for you. You must be wondering where to start. Well, I would suggest you start with simple Python program. You can very easily learn to code Python with the aid of my tutorials. Initially, I start with the concept then explain the syntax. Thereafter use it in a very practical example. And all this in understandable lingo. So, you don’t have to be a seasoned programmer for learning Python. Even if you are just a beginner – I got you covered! Also finding a good Python IDE or editor to work on is a good place to start. Here you can read about IDE Vs. Editor in a short Facebook note that I did a while back. Don’t worry, it’ll take just five minutes! Is Python Hard To Learn? So, till now you must have understood that Python is a diverse yet simple and efficient computer programming language. Furthermore, it is easy to learn too given that the approach you are taking suits your learning style. The beginning of anything can seem intimidating. However, once you start your journey with Python programming examples, the task doesn’t seem that daunting. The main reason behind this is that Python source code is not very tough to learn. The syntaxes in Python language are unbelievably simple. This means they are easy to remember and apply. Also, debugging becomes a piece of cake. On top of that, if you are using good IDE then it does that for you! So, that’s one thing taken care of. Start With How To Install Python 3 with this quick tutorial here. That’s all good! But What Is The Best Way To Learn Python? The best way to learn anything new is to start small. Take one step at a time. There are many paid online courses that demand hundreds of bucks but you don’t necessarily need to enroll in them. Most of them are rip offs and overpriced. Occasionally you may find something useful but largely they all are the same. Unlike at rebellionrider.com they don’t give you an edge. I try to give you action-packed content. Meaning, maximum all-round info in crisp tutorials. This ensures that you are not only well-versed in the Python programming syntaxes but can also successfully answer interview questions. Here you can get basic and advanced level resources for free and learn at your own pace. There are both informative blogs as well as video tutorials on the latest Python 3 version that will assist you in your journey. The medium of learning Python programming is totally your choice. 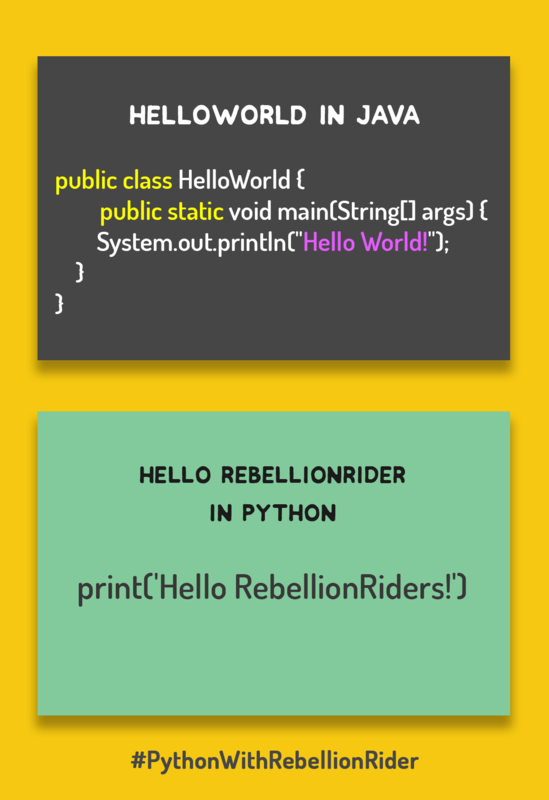 You can check out some beginner friendly Python programming tutorials here. These will give you the much needed Python programming exercises to become a seasoned Python developer. Furthermore, if you are a fresher then do consider joining an internship (not necessarily paid) where you can hone your Python programming skills on live projects. Learn to write your first Python program in less than 10 minutes. So, What’s The Big Take Away?! Yes, you may still be wondering what’s the point of this whole rant! 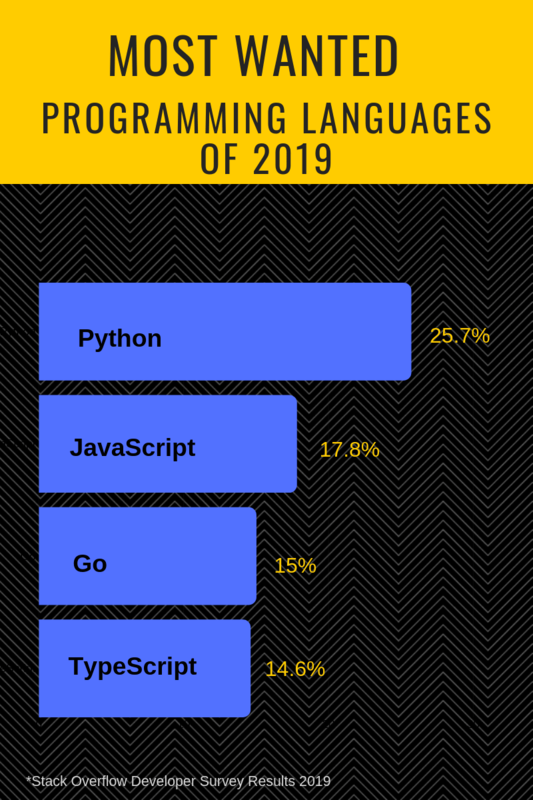 Folks, the point is that it’s a fact that Python programming language has climbed the ladders of popularity pretty fast. And its still on the upward move. Python developer has become one of the highest paying jobs around the world. It’s easy to learn and has multiple applications in different IT fields. Therefore, in 2019 it makes sense to get your Python programming skills up to date. Since Python code doesn’t use semi-colons hence it reduces the scope of error while writing code especially the huge ones. Happy learning. Good luck & Godspeed! Next articleHow To Win The Giveaway! What Is The Eligibility Criteria For Oracle Database Certification?